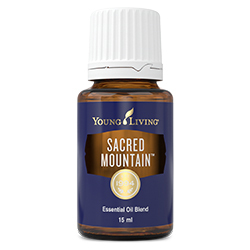 Sacred Mountain™ is a blend of Ylang Ylang and conifer oils that evokes the sense of sanctity found in nature and promotes feelings of strength, empowerment, grounding, and protection when diffused. This uplifting and peaceful blend has an exotic, flowery scent, and may bring awareness to consciousness on a personal level. Dilute and apply to ears, heart, neck, wrists, temples, or crown of head to encourage personal change and uplift the spirit. Diffuse to aid in recharging emotional energy. Complementary essential oils include: Release, SARA, Grounding, and Frankincense. Northern Lights Black Spruce (Picea mariana) leaf oil †, Ylang ylang (Cananga odorata) flower oil †, Balsam Canada (Abies balsamea) needle oil †, Cedarwood (Cedrus atlantica) bark oil †.